I admit it, I am a bit of a nerd when it comes to traditional architecture. The older and more decrepit the better. So when I came across this amazing little village, Pera Orinis, on my way to a nearby excavation, I made up my mind I would come back to explore properly. It didn't occur to me that buildings constructed of mud brick, exposed timbers and collapsing frames, and silent, narrow, cobbled streets would not be everybody's cup of tea. 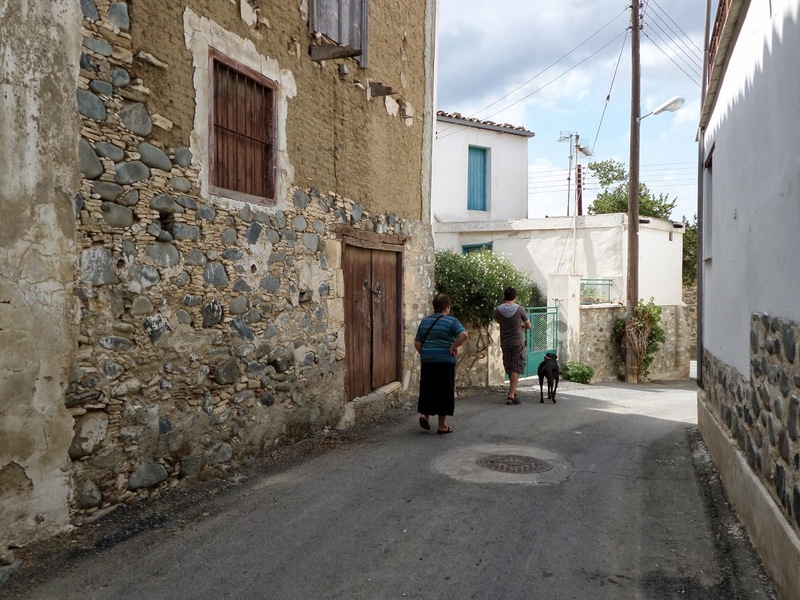 So I feel obliged to emphasise the facts that a) there isn't much to do in the village, just bimble about looking at the houses and views, and b) the houses are made of mud brick and the streets are extremely quiet, so if this is not your thing, then I suggest you give Pera Orinis a miss! I loved it. I just wish I had had the time to explore properly. The buildings are fantastic. They consist of a high stone socle, which takes the form of a neatly arranged 'rubble wall' (small chips of stone wedging larger stones in place), above which row upon row of thin mud-bricks are lain around a timber frame (timber used for the second story floor, to strengthen windows and doors etc). Some of the buildings are then coated with a protective layer of mud plaster. 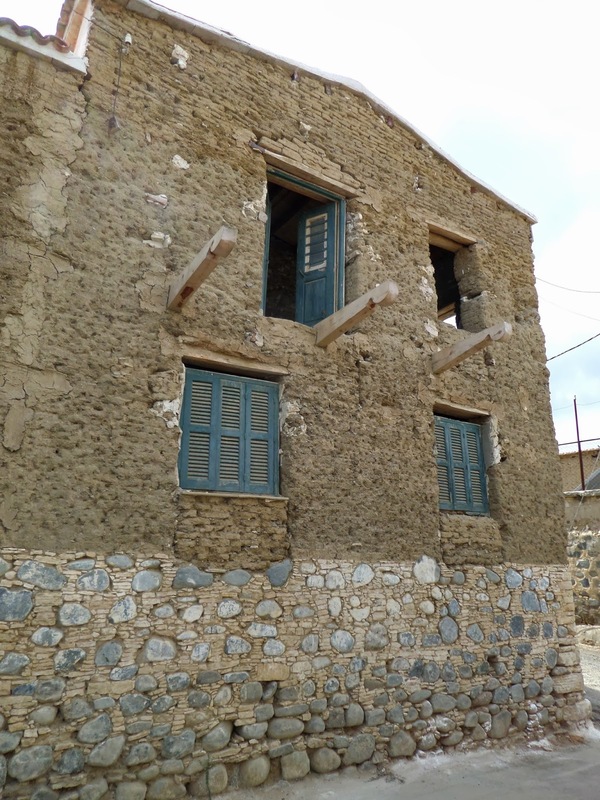 I saw that modern repairs to some of the buildings had been carefully undertaken with the same traditional materials. 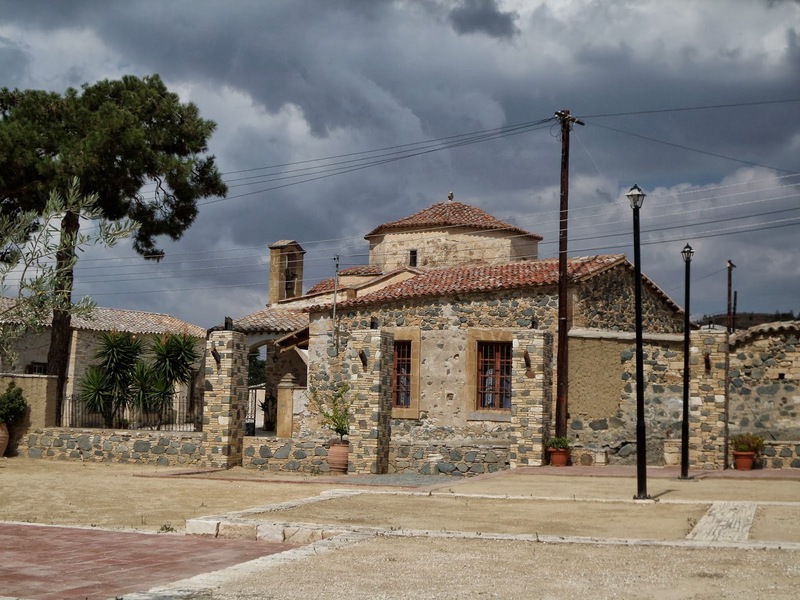 In the centre of the village is a small square (plateia), with a church, a municipal building that used to be a school, and a kafeneio. Unfortunately the cafe was closed when we were there. I'm not sure how much Sage enjoyed the village. She often does like sniffing her way through new streets, enjoying new smells and sounds. I had wanted to take her to the 'nature trail' that I had seen sign-posted, but this idea was not very popular. I didn't manage to find this trail on-line, so maybe I will go back and explore further. As the kafeneio was closed and we needed a rest, we found our way to the next village, Politiko, and sat at one of the only places we found open (midday, midweek, out of season). According to a sign on the floor, the taverna was called Gefyra - Bridge. It was fine. 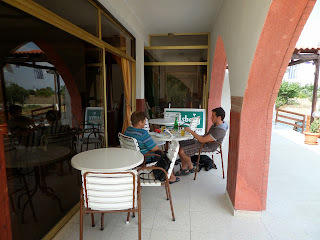 They were not really expecting customers until the evening, so had a very limited menu (omelette, salad, halloumi etc). During the evenings they bbq meat and various dishes. I found the decor a little bit strange, kind of like a hotel reception, dark and uninviting. I would not have chosen this place if we were not quite desperate to sit down and escape the sun for a while. But having said that, the food was fine and inexpensive. 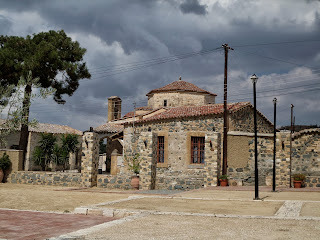 After resting for a while we drove up to visit the Monastery of Saint Herakleidios, which is a functioning convent. Some foundations remain that date back to the 3-4th century, making this an extraordinarily early Christian site. Most of the church has been re-built and re-decorated in fairly recent history, although some small areas of mosaic floor are exposed below the modern church floor (dating to about the 6-7th century, I think), while some wall paintings survive from the 12th century. Of course, Sage stayed outside while some of us went into the Monastery. Also of interest in this area are recent (ongoing) excavations at the Bronze Age site of Politiko-Troullia (see link: http://www.archaeological.org/fieldwork/afob/2064). This team, from the Arizona State University, works during early Summer. Check the website to find out when the site will be active.